Nebraska took down UC Riverside 7-1 on Sunday, completing their 3-1 opening series victory against the Highlanders. In total, the Huskers scored 47 runs on the weekend. Freshman Aaron Palensky opened up the scoring for NU in the top of the first, slapping a base hit into the outfield to drive in Angelo Altavilla. In the third, Luke Roskam extended the Husker lead, knocking in two runs after making solid contact on UC Riverside starting pitcher Jeremiah Priddy’s pitch. On the mound for the Huskers was freshman Colby Gomes out of Millard West High School. He had an excellent outing, pitching four shut-out innings. On the day, he allowed six hits and struck out two. At one point, he had set down seven batters in a row before allowing a hit to break the streak in the bottom of the fourth. Matt Waldron came in to replace Gomes in a relief appearance to close out the final five innings. The righty reliever sat down 12 consecutive batters before the Highlanders were able to put muster up a hit in the bottom of the ninth. In that same inning, they also mustered up their lone run of the afternoon but Waldron slammed the door soon after that, recording his seventh strike out to win the game. Due to their depleted bullpen, the Highlander’s starter Priddy went 6 1/3rd innings. He was replaced in the seventh after giving up his fourth run, asAltavilla recorded the RBI to bring in centerfielder Blake Peterson to make it 4-0. Andre Granillo took over from Priddy, but was unable to keep the Husker bats quiet. Nebraska added three more runs in the ninth off of two hits to make it 7-0, adding to the punishment. Freshman Spencer Schwellenbach went 1-4 with an RBI and scored two runs. Altavilla had two hits on top of one RBI. Additionally, Palensky and Roskam both drove in a pair of runs. 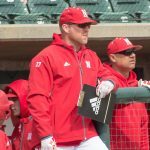 After dominating in the series opener in a 21-6 beat down Friday night, Nebraska dropped game one of their doubleheader on Saturday, 10-9. However, they bounced back in game two, downing UC Riverside 10-6. Next, NU will take on the defending national champions, the Oregon State Beavers in Surprise, Arizona as part of the Big 10/Pac 12 challenge. That four game series will begin on Thursday. Pregame coverage will begin at 1:30 on KLIN.